Imagine stepping back to a time when you would hear the sound of horses’ hooves clip-clopping down the cobblestone streets of Manistee as you board a street car at the station in your neighborhood to go downtown for the evening. This was a regular occurrence experienced by many residents and visitors to Manistee, day in and day out. Manistee's street car system was an elaborate network of rails that ran people to and from their destinations for years until the automobile ultimately forced the street car to cease operations. Even though street cars no longer operate in Manistee, you will often see the vehicular version of the street car (also known as a trolley) in operation throughout Manistee touring various historic attractions. 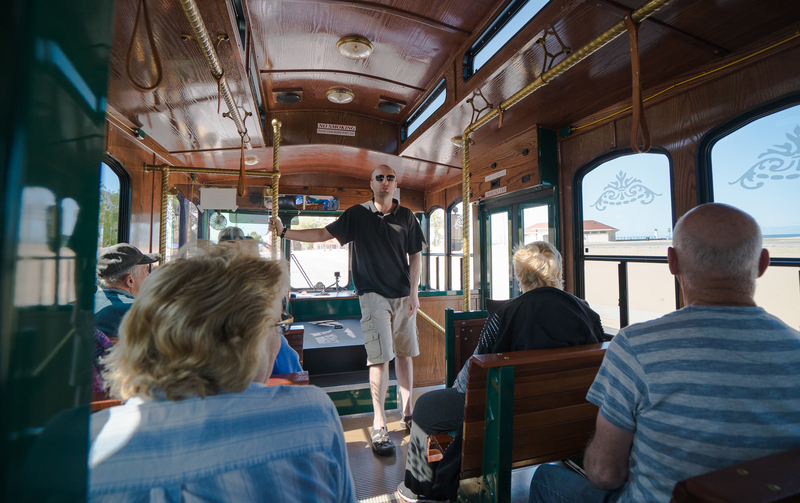 These beautifully restored Trolleys are a sought-out attraction by many visitors and residents looking to visit, learn about and explore prized historic treasurers. As you board, you will be met by friendly and knowledgeable guides dressed in period attire. Beginning on River Street, you will tour the City of Manistee which includes various historic sites, museums and beaches. You will then make your way out to the beautiful state park and rural attractions. Once you return we encourage you to ask questions and explore some of the historic sites on your own starting at the Manistee County Historical Museum and using the Historic Sites Tour guidebook. 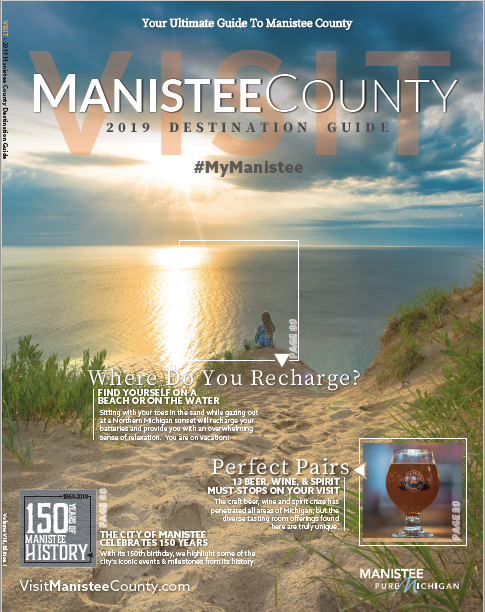 The book features over 100 sites in Manistee County and includes links to 25 historic site videos, also available at Manistee County Historic Sites Tours. 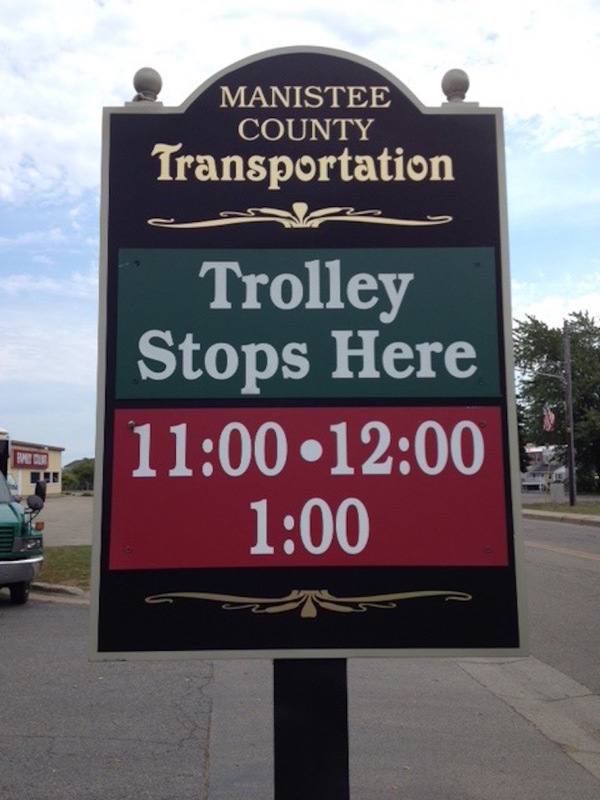 The trolley tours last approximately one hour, and begin at the Manistee County Transportation Center on Memorial Drive in Downtown Manistee. Tours begin at 11:00 am, 12:00 pm, 1:00 pm, 2:00 pm, 3:00 pm and 4:00 pm and are a great way get your bearings when visiting Manistee County for the first time. 2018 TOUR SCHEDULE: Hourly tours are available June 18 thru September 1. You may hail a Trolley as it passes, or you may begin on the hour at the terminal on Memorial Drive. View a map to the pick-up location here.